Patricia A. McDonell, 90, of Monticello, passed away Sunday, August 27, 2017, at Monticello Nursing and Rehabilitation Center. Visitation will be held from 4-8 pm Thursday, August 31, 2017, at Kramer Funeral Home in Monticello where a parish vigil service will be held at 4 pm. Visitation will continue from 10- 11 a.m. Friday morning at Sacred Heart Catholic Church in Monticello . A Mass of Christian Burial will be at 11 am Friday, September 1, 2017, at Sacred Heart Catholic Church with burial in Sacred Heart Cemetery. Rev Paul Baldwin will officiate. Patricia was born April 27, 1927, in Monticello the daughter of Joseph and Angie (Bader) Oswald. She married William F. McDonell on November 14, 1945, at Sacred Heart Catholic Church in Monticello. Together they farmed south of Worthington and owned and operated the Monticello Sale Barn for nearly 30 years. 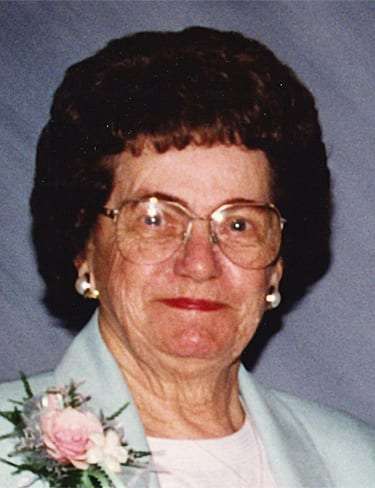 She was an active member of the Sacred Heart Parish. She was preceded in death by her parents, husband William, a son-in-law, John Geers, 2 grandsons-in-law, John C. Hall and Steve Weaver, a great-great grandson, Zayden Weaver, a sister, Mary (Harold) Schneiter, and two brothers, Lloyd Oswald and Earl Oswald, and a brother-in-law, Bob Hunt. Memorials are preferred to Sacred Heart Catholic Church and School.